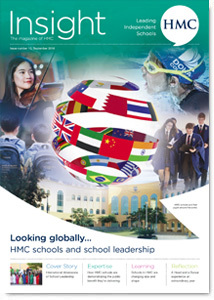 Looking globally…HMC schools and school leadership. 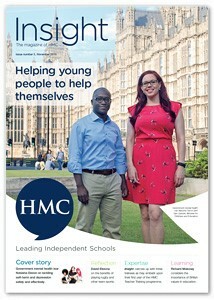 Outgoing HMC General Secretary William Richardson reflects on the place of schools in UK society. Marco Longmore and Simon Corns on setting up and running top quality British schooling in the UAE. Will Phelan outlines the future-oriented dynamic of his schools’ joint structure. 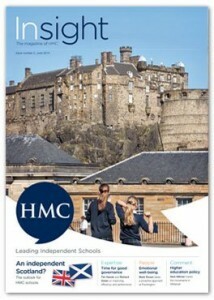 Joe Spence reviews the future of independent/state school partnerships. 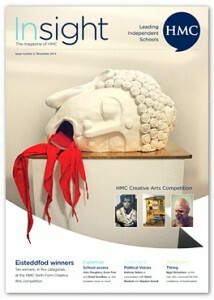 View individual articles from the magazine here. 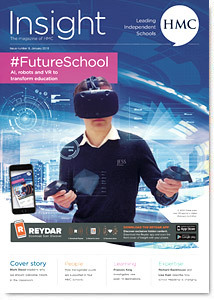 #FutureSchool: How AI, robots and VR are set to transform education. Mark Steed explains why we should welcome robots in the classroom. How transgender pupils are supported in four HMC schools. Frances King investigates new post-18 destinations. Richard Backhouse and Lisa Kerr describe how Headship is changing. Tech Control! 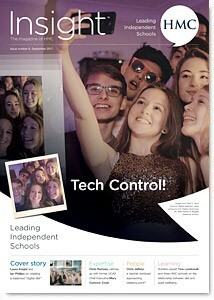 - Safety and mastery for pupils in the digital space. UCAS in the 2010s: Chris Ramsey interviews Mary Curnock Cook. How to get on. Kim Eccleston and Jonathan Black talk about interviews, university applications and career plans. School partnerships and impact evaluation. School qualifications and preparation for university in a devolved UK. Guy Fawkes, grammar schools and David Cameron: Leo Winkley interviews Neil Carmichael MP, Chair of the Education Select Committee. Insight asks Mary Breen and “search industry” figures to reflect on how talent is fostered in schools. Douglas Robb, Ruth Mercer and three Directors of Sport: how schools can sustain girls’ participation in sport. Martin Collier and Mark Lauder on bringing order to the world of private tutors and entrance exams. 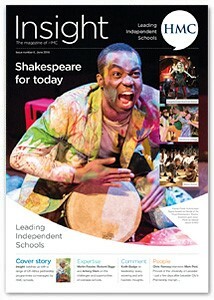 Antony Faccinello, Paapa Essiedu and Jacqui O’Hanlon on theatre, education and the world of acting. Martin Reader, Richard Biggs and Antony Clark on the challenges and opportunities of overseas schools. Nigel Lashbrook and Joe Spence reconsider careers education - what it has been and what it should become. Government mental health tsar Natasha Devon on tackling self-harm and depression safely and effectively. David Elstone on the benefits of playing rugby and other team sports. 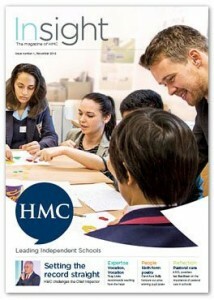 Insight catches up with three trainees as they embark upon their first year of the HMC Teacher Training programme. Richard Maloney considers the importance of British values in education. 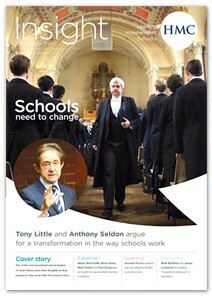 Tony Little and Anthony Seldon on why a transformation of teaching and learning is needed. Sue Freestone reflects on recent dramatic changes to pastoral care in schools. Steffan Griffiths considers what the recent HMC sport survey means for young people. Mark Mortimer and James Lockwood consider the value of armed forces connections. Submissions can be made to editor Dr Tim Hands on [email protected]. Insight magazine does not carry advertising.